As of fall 2017, 39% (11,109) of UC San Diego’s undergraduate students identify as a first-generation college student. UC San Diego recognizes that first-generation college students face unique barriers to success, but we also celebrate and note the strengths and talents they bring to the campus community. To provide greater support for UC San Diego’s first-generation college students, Triton Firsts is a comprehensive initiative to engage first-generation professors, lecturers, researchers, staff, graduate students, and alumni at UC San Diego to inspire and equip first-generation students to excel during their undergraduate journeys. Collaborating with campus departments to provide a culture of support for first-generation college students. Research shows that positive relationships with faculty and staff greatly impacts student retention (Bordes & Arredondo, 2005; Schreiner et al., 2011; Strayhorn, 2008; Torres & Hernandez, 2009). Furthermore, it is evident that each interaction with faculty, staff, and administrators plays a role in shaping student’s perception of the campus (Braxton et al., 2004). When students have positive interactions with faculty, staff, and administrators, they are far more likely to believe that their institution is place where they can thrive and as such, students demonstrate a greater degree of social integration and persistence when attaining their goals (Braxton et al., 2004). 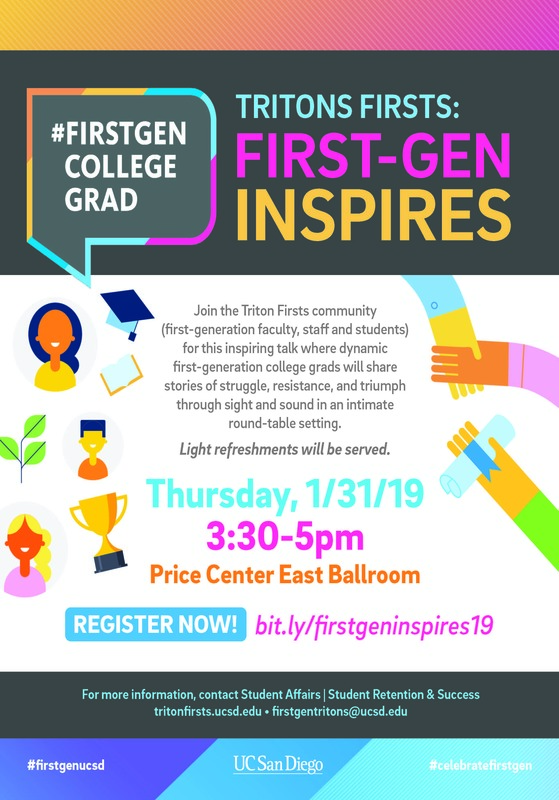 Please join us in this Triton Firsts initiative which focuses on creating relationships between first generation faculty, staff, and students. Be a part of a community that reassures students that despite the challenges they may face, they will be supported and they have everything it takes to succeed at UC San Diego! Sign up for Our First-GEN Inspires Event! 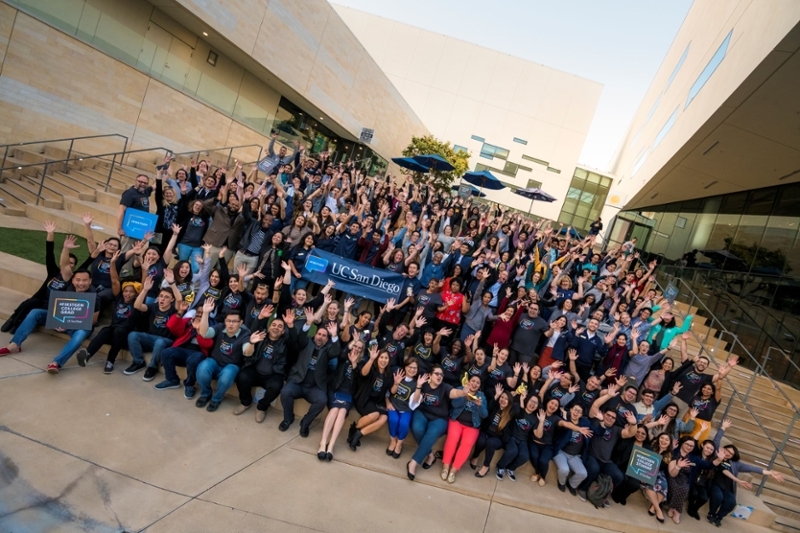 UC San Diego’s first-generation community- Triton Firsts- came together for this historic all campus photo to celebrate National First Generation Celebration Day commemorating the 53rd anniversary of the Higher Education Act, paving the way for many first generation college students to earn their degrees. 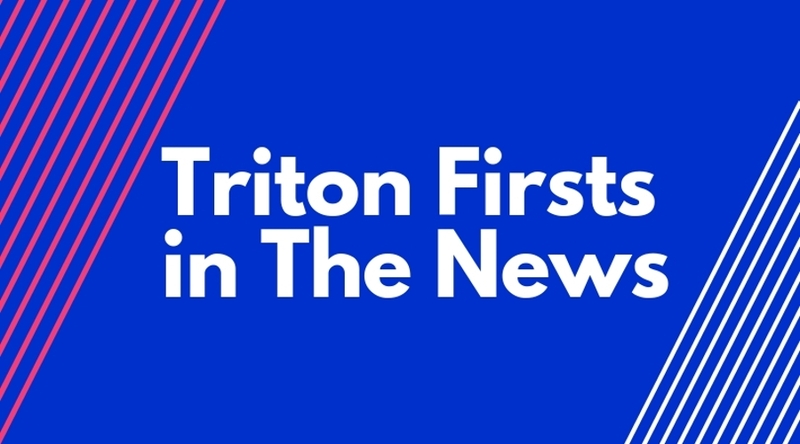 Explore how the Triton Firsts Initiative is making an impact at UC San Diego!